Today is the 4th Day of the 13 Day Rhodophoria Celebration! Sorry I’m a little late. I got distracted updating the website. More changes to come with that. I’m hoping to change the theme soon, among other things. 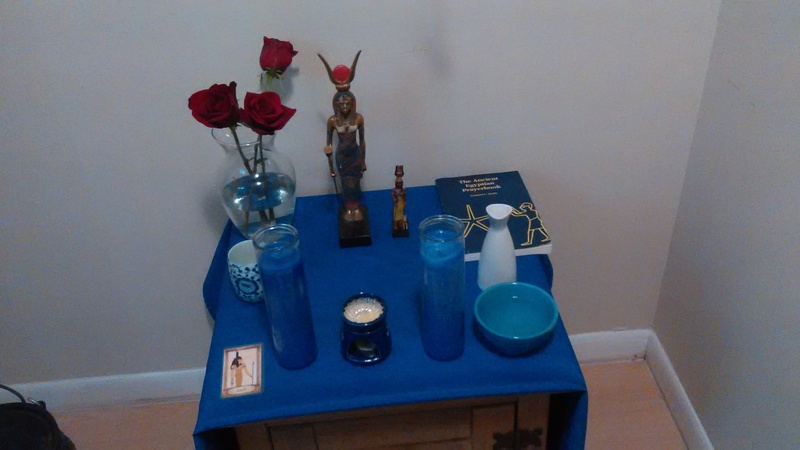 So there is my Aset shrine pictured above! She has three red roses for the Rhodophoria festival! In another shrine in my home, for Wesir, Aset and Heru-sa-Aset aka the Holy Family Shrine, I put some yellow and a few pink roses for them. Happy Rhodophoria, everyone! And please remember, this is also a time to honor the military dead as well as the Goddesses associated with the festival!